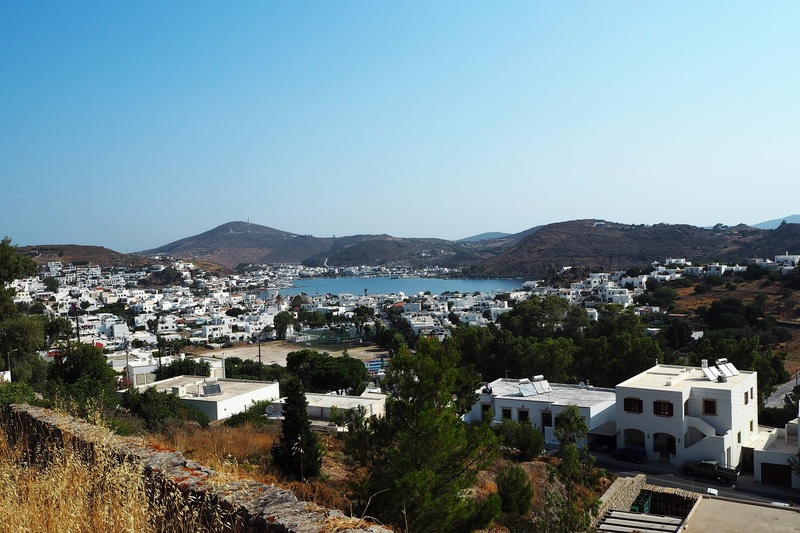 In the Book or Revelation, St. John recorded the visions he received in a cave in the beautiful island of Patmos. This cave lies halfway up to the Monastery of St. John and along the way of Skala and Chora (meaning island’s capital in Greek). It is believed that St. John, or else known as the St. John the Theologian was from Ephesus, which is a short boat ride from Patmos and received the first of the letters addressed to the Seven Churches of Revelation here. We started our hike early in the morning, armed with loads of cold water, sun protection cream, sunglasses and hats, hoping that the sun won’t catch us! We took some shortcuts through the woods and no more than half an hour later made it to the Cave that had a stunning view to the port of Patmos. There’s a dress code for these visiting the Monastery and the Cave, it is not something extraordinary you simply have to be respectful and appropriately dressed, not wearing mini skirts or shorts or having much of your body exposed. As I wasn’t prepared for this visit, Rukiye kindly gave me her yoga trousers and I wore my favourite FatFace camisole on top-best thing to get on a holidays to a summer destination I can tell you! I am planning to do a Style Edit post so more about my outfits later on. For 4e I got myself a wooden cross necklace, which I wear constantly since then and has already brought me luck. Ayla yesterday said I have a shield in my life, well from now and on I sure have! Soon it was time to keep hiking towards the Monastery and the views along this hike rail were pretty stunning giving us a clear view of Patmos castle. At the end of the hiking trail you go through the Chora and there are loads of cute shops selling local, handmade products. I felt in awe of the Monastery’s premises and views to the island. Here the monks live in peace and pray to the God for love, health and happiness for all human beings. The great thing about Monasteries is that regardless of your religion you can find a peaceful corner and meditate, clear up your head from negative thoughts and come back to reality fresh. In our group not everyone is a Christian Orthodoks, we are a happy mix of all religions-but everyone got a big smile on their face as soon as we got inside these Holy grounds. And that’s the magic of Monasteries, you don’t have to believe in God to find some personal peace in the moment, you just have to let yourself be! Thanks once again to the MDFV for hosting us and touring us around these unique locations.